Astraweb has been around since 1998.They set the bar for other Usenet Service Providers when they increased their retention by 400% and offered it at a low price. They are not reseller but have server farms in US and EU. They don't have a lot of features but instead concentrate on growing retention, maintain completion and monitor speed stability. Usenet News Server plans can subscribed by either an unlimited plan or a pay-by-download plan. The unlimited plans go for $10 and $20 for one and three months respectively. These packages have speed limitation of 10Mb/s. You can also purchase unlimited DSL which comes with unlimited speed at $15 per month or $39 for three months. The unlimited plans are best suited for the heavy users of Usenet. The pay-by-downloads plans include the 25 GB, 180 GB and 1000GB packages. The payments are all done as a once-off. The purchased downloads don't expire, 50 connections and speed is unlimited. Payments can be made via Paypal, Visa, Mastercard, iDeal, Discover, Sofort and American Express. Astraweb does not offer a free trial. Astraweb has 2272 days of retention for binary news groups. The retention quoted is for all groups. The completion rate is also very high, at 99% across hundreds of news groups. Astraweb servers are located in Europe and the United States for maximum performance. Each account offers up to 20 connections for the unlimited accounts and 50 connections for the block accounts. Free SSL is offered with all the accounts in addition to alternate ports for cases where the customer's ISP throttles bandwidth. Astraweb offers various packages that include Microsoft Outlook Express. They however, highly recommend the use of Newbin pro. Their most impressive feature is the diversified plans they offer. They also offer excellent posts propagation with many peers. Astraweb offers great customer support to all their members. The online support is offered through a ticketing system. A highly knowledgeable team is always available 24/7 to deal with whatever issue is at hand. They also have a trouble-shooter which takes you through a step by step tour in an attempt to solve your issue. A FAQ page is also available on their website with categorized listing of general and common problems and their solutions. 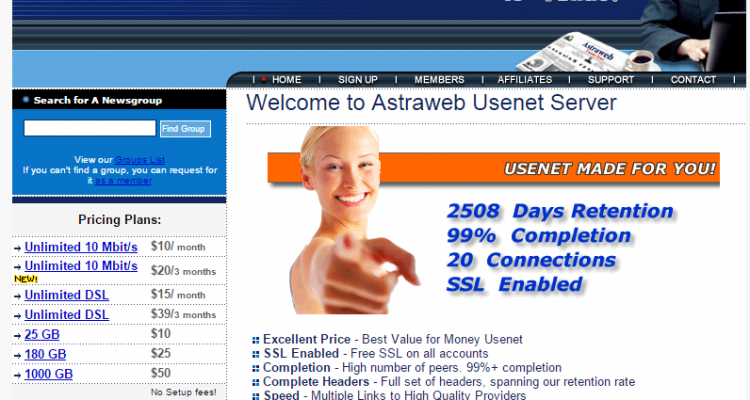 Astraweb offers some of the best bargains in the Usenet Service Industry you definitely won't be disappointed.